First Novels Club: A book I've always wanted written is ACTUALLY REAL! A book I've always wanted written is ACTUALLY REAL! In my junior year of high school, I took AP U.S. History, and we learned about the Roanoke, VA colonists who literally disappeared without a trace. Now, I never ended up actually writing a novel until six years later --- and it wasn't about the Roanoke colonists. But I never forgot that note, and the story still captivated me. AND LISA KLEIN WROTE ABOUT IT!!! I was reading the Story Siren's latest Books to Pine For post, and came across Cate of the Lost Colony, coming out this October. I clicked on the Goodreads link because the cover and title intrigued me, and when I read the description I squeed with joy. Thank you, Lisa Klein, for fulfilling a book dream of my sixteen-year-old self. Heck, of my twenty-four-year-old self. Is there a tiny bit of present-day, writer-me that's sad because I wanted to write the book? Sure. But hey, the colonists have many more stories that can be told --- and plenty of possibilities as per what actually happened to them --- so I'm not counting it out for the future. I know I have my own version of the story just waiting to be written, and my own MC who needs a voice. But until then, OMG, October needs to get here. NOW. Anyone else find the Roanoke story fascinating in high school? Is there a book you've always wanted to be written? 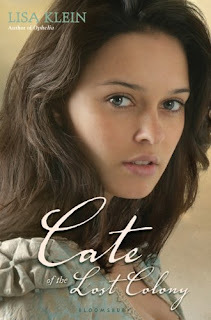 Who else can't wait to read Cate of the Lost Colony?! I've been pumped about this book for some time because a) it's about Roanoke and b)Lisa Klein wrote it. Her books are SO good! Jessica - I swear, that Roanoke story was one of the coolest things I've ever learned in a classroom. I mean, addition came more in handy, but still! Mysterious disappearances FTW. Yeah, I sort of enjoyed AP US History way too much. Roanoke was definitely one of the most fascinating stories from that class. Very mysterious. The show Supernatural has it's own little twist/nod at it. But yeah, I'm so curious to know what happened to them! WILL HAVE TO check this book out! Thanks! That book looks really cool. I think Dean Koontz wrote a book that was a little bit about this back in the 90s - Phantoms. But it was more about something happening in the present that also caused the Roanoke and other disappearances in history.